When noted theater director Tyrone Guthrie put out a call in 1959 for cities to host a new type of residential theater company, seven cities responded. One was not only interested but also eager: Minneapolis. Guthrie and his team visited and were enchanted by the people in America’s heartland: cultured, educated and enthusiastic. In 1963 the Guthrie Theater was born, and it has become one of the nation’s leading regional theater companies. In 1881, native New Yorker George Draper Dayton determined Minneapolis offered the strongest opportunity for growth in the Midwest and founded the Dayton Dry Goods Co. on Nicollet Avenue. His store became known for dependable merchandise, fair business practices and a generous spirit of giving. Since 1946, the company has given 5 percent of pretax profits back to the community, a practice continued today, though Dayton’s department store has transformed to one of the nation’s largest discount retailers: Target. Culture, education and enthusiasm. Dependability, fairness and generosity. Innovation and initiative. Those words describe the heritage and spirit of Minnesota, particularly the Twin Cities of Minneapolis and St. Paul. They are why so many great things have started here and why it is appropriate that the Minneapolis committee selected a theme of “It Starts Here” for the 2011 convention. Where to start? More than 300 training sessions touch on every aspect of today’s journalism. In addition, we offer issue seminars on today’s tough topics, keynotes from media leaders and an array of personal experiences, including Break with a Pro, Swap Shops, contests and on-site critiques. We should highlight the dedication of the local committee, whose planning for more than 18 months has produced a fantastic menu of offerings and a lot of local flavor. 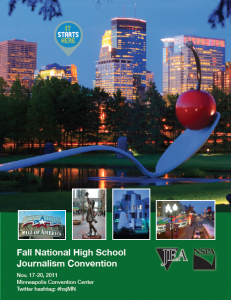 The Minneapolis Convention Center will host all convention programming and events, including the keynote sessions, adviser luncheons, awards ceremonies and even a live radio broadcast. After hours, explore the culture and sights as you experience this dynamic city. Just don’t get lost in the Skyway! So many great opportunities lie ahead during the next four days. Absorb the innovative ideas from the speakers and your peers. Introduce yourself, start networking, get energized and figure out how to put your new ideas to work. That spirit has inspired generations of Minnesotans to just get started. What will you start here? We can’t wait to see.